It’s hard being a healthy food crusader. It can be a lonely cause. It would be so easy to say, “Sure, have as much bacon as you want…yes, chocolate chip cookies are a good snack anytime….or no, you don’t need to eat veggies every day.” Life would be so much easier. But no, I was born with the curse of being a nutrition-loving foodie, making it my personal goal to turn my children into health-conscious little foodies, too (and anyone else who is willing to listen). Although most of my articles have talked about food successes with my kids, don’t be fooled – it hasn’t all been easy. It’s definitely had its ups and downs. Making the right choice doesn’t always mean the popular choice. That became all too obvious when last week, my 5 year old son, decided that he wanted to go away for March Break with his dad and sister, without me, so they could eat all the deep-fried hash browns they wanted. Sure, it sounds funny now (all right, it was even funny then) but surprisingly, that little comment cut me deep. It put me into a week-long funk of: why am I working so hard to get good food into them, when it’s so unappreciated? Unfortunately, in this uninspired week, all I discovered is that the old kids’ saying is true: it’s not fair. All the fanfare is for junk food and fast food – it’s fun, easy and cheap to go out for a burger and fries or buy chocolate at the corner store. Not to mention all the other resources for tasty sugar, fat and salt that healthy food lovers are constantly up against. So how can we compete? It just means we need to work a little harder to show them that good food can be delicious and enjoyable, too. With some commitment from the whole family, we can have some control over ours and our kids’ food future. It’s taken some time but my husband is starting to actively support this, too. Historically, his diet has been worse than the kids. Now recently, his meals have lots more salads and ground up secret veggies. Definitely, a step forward. On the kids’ side, some days will be harder than others. But I strongly believe that if we’re consistent about healthy options, that when we’re not watching, they will make some healthy choices on their own. Yes, it is possible. I was at a pizza dinner at my kids’ school this week. Guess what was beside my son’s chocolate brownie? A pile of yellow peppers, carrots and cucumbers: his choice. I was so proud. It’s hard to always keep a positive attitude but I’m trying to remember these little victories. Despite the “fried hash brown” setback, if they can inadvertently choose healthier foods, my conviction grows stronger. And there is strength in numbers. The more people fight the good food fight, the more it becomes the norm. There’s more and more involvement from individuals, communities, corporations and governments on the importance of good eating and getting that momentum started at a young age. It takes time to change people’s perceptions and food prejudices but it can be done. That may sound cheesy but look at what Jamie Oliver has done for kids’ school lunches in the UK and his food foundation. Truly inspirational. So the next time you feel like you can’t steam another head of unloved broccoli, find some solace in knowing that you’re not alone in the healthy food crusade. We’re making progress. Keep doing what you’re doing. It’s for all the right reasons. Don’t be afraid to sneak that goodness in. 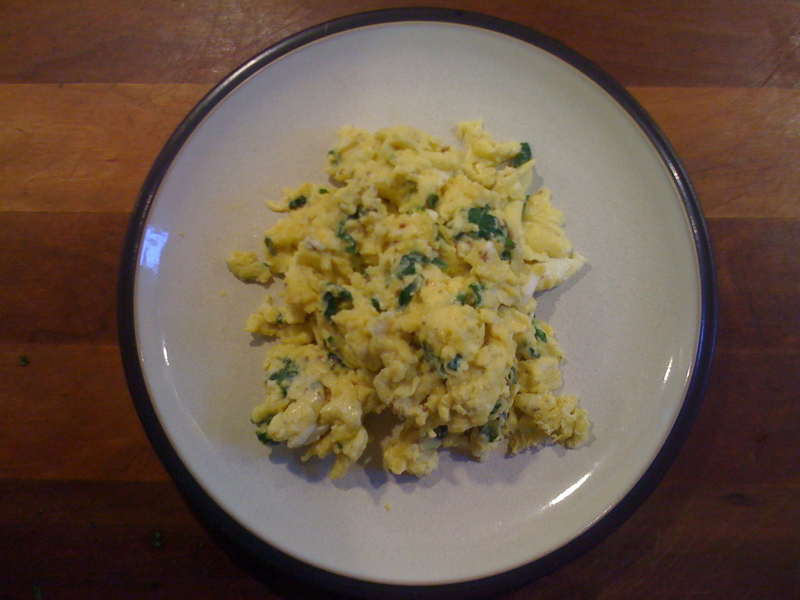 I like putting chopped spinach and flax into their scrambled eggs. It tastes the same to them and now that I’ve done it for so long, it’s not weird for them to see greens in all sorts of their dishes. This entry was posted in All Articles, Random Foodie Thoughts by Mumobelly. Bookmark the permalink.